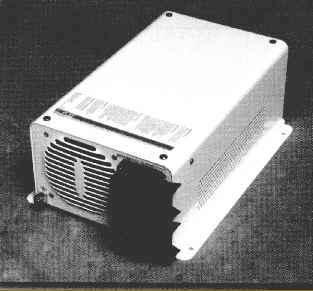 Sorry, but these inverters are no longer being manufactured, check out our grid-tie inverters Here. for homes, offices, light industrial, and remote power applications. The new UX series of inverters is the best choice for systems of 600 to 1400 watts when efficiency, modest power and economical considerations are of prime importance. 1.) Remote Control (RC-8/50 or RC-8/100) may be panel mounted 50 or 100 feet (15 or 30 meters) away for convenient indication of inverter's operating status and ON/OFF control. 2) Stand-By (SB) includes automatic battery charger and AC transfer switch. 3) Battery Temperature Sensor (BTS) automatically controls accurate charge. Step Up to Trace Inverters by Xantrex! Other low cost inverter brands will only sustain a large power requirement for a moment. The Trace UX series can start and run high power loads of twice their rated power for nearly a full minute. And with Trace, you get the most sophisticated protection circuitry in the industry, a full two year warranty on parts and labor, and the security of knowing you have the most dependable power inverter in the world. 1) 600 to 1400 watts continuous output inverters with a high battery performance battery charger option available. 2) High efficiency, high surge capacity, low idle current. 3) Low power "search mode: to conserve energy. 5) Optional three stage charger with temperature compensation (SB models only). 6) Fast switching for standby power systems (SB models only). 7) Certified to UL standard 1741 for PV Power Systems and CSA-C22.2, No. 107.1M91. Convenience: Enjoy using standard home electrical appliances and tools from your batteries. The UX series converts DC battery power into normal household AC to run hand tools, microwaves, televisions, computers--almost any small to medium sized equipment--even small refrigerators which have high current demands. Automatic Operation: Plug into utility power or rev-up your generator, and the UX model inverter starts charging your batteries and automatically transfers power to your electrical system. It charges rapidly and completely without overcharging, and maintains a full charge indefinitely. The high-power design charges batteries in three stages: bulk, absorption and float. When your AC input power fails, transfer to inverter power is automatic and typically within 16 milliseconds to keep lights, phone, appliances, and most computers running without missing a beat (this feature only available with the SB battery charging option). Protection: In the inverter mode, the unit automatically turns off to prevent batteries from running seriously low. The UX design ensures long battery life and is compatible with both sealed type or liquid lead acid type batteries. Other protection guards against over temperature and overload. The crystal controlled voltage and frequency circuitry also protects your appliances from damage. Designed for maximum service, all UX models offer power coated chassis, stainless fasteners, conformal coated circuit boards and gold plated connectors. AC wiring terminates cleanly inside the wall or shelf mountable chassis. The Trace UX series of compact inverters provides quiet, dependable power whenever and wherever you need it, at a price you can afford . Call for availability and freight on these inverters! NOTE: Below pricing reflects Trace's list pricing; if you buy your system from us, major system discounts will apply. Call us for your pricing on Trace components. RC/8-100: 100 ft. ON/OFF remote with LED status indicator .